The California Umbrella wood market umbrella with half-inch reinforced fiberglass ribs masquerades as a residential umbrella but is really designed utilizing commercial features. The fabric is reinforced with flexible fiberglass ribs while the structure is supported with a heavy-duty hard wood pole adding to the longevity of this umbrella and providing flex during periods of high winds. The California Umbrella wooden market umbrella incorporates a pulley system to open and close this umbrella. This wood market umbrella utilizes a one and one-half inch wood pole made from hardwoods not pine for durability as well as stability. Another great feature of California Umbrellas is their commitment to using the finest outdoor fabrics available. This may add a little extra to the price but guarantees an outdoor patio umbrella that is sure to keep it good looks and last considerably more than a single season. 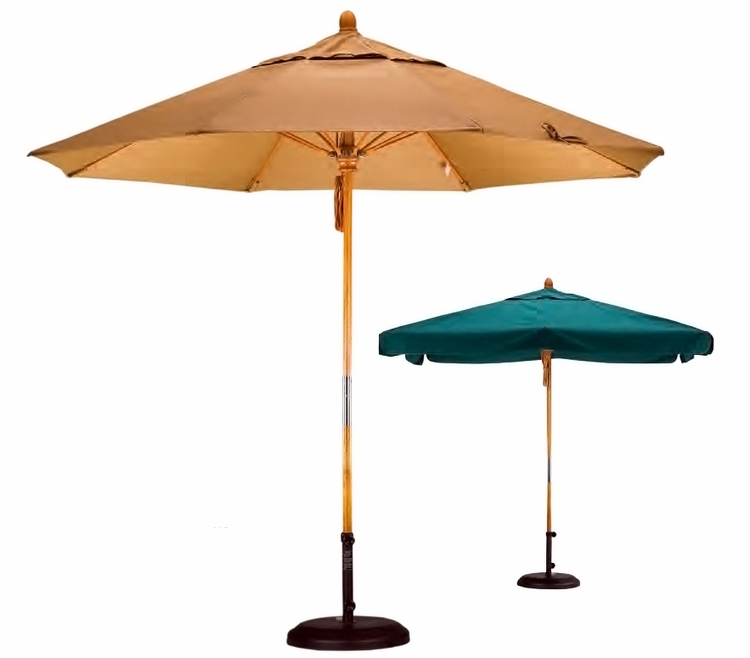 This wood market umbrella with fiberglass ribs can be outfitted with your choice of over 160 Sunbrella fabric colors and patterns that are available is three separate grades of Sunbrella outdoor furniture fabric. The premium quality as well as the different grades of Sunbrella fabric all come down to a more sophisticated dye process and in industry standards enjoy the highest rate of U.V. blocking capability over a period of time. The higher the grade the longer the U.V. blocking time span basically meaning that the wood market umbrella fabric will be less susceptible to fading and continue to maintain a high level of U.V. blocking. A selection of color and patterns can be found at the Sunbrella Fabric Showroom located by clicking on the Sunbrella logo at the bottom of this listing. Head over to the Furniture Outdoor Fabric Section and be sure to write down your desired Sunbrella Fabric Color and the Sunbrella Fabric Number and make that choice under Item 2 in the selection area of this listing.